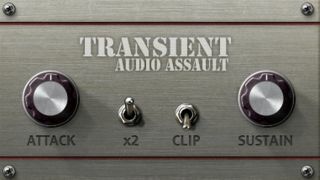 Transient shaping plugins aren't exactly a new idea, but if you don't already have one, Audio Assault's new Transient processor could be of interest. This promises to "increase the attack of a snare, highlight picking on an acoustic guitar or smash a drum room." The first point in its favour is that it's free, and with just a couple of knobs to tweak (plus a x2 switch to intensify the effect), it's not exactly going to confuse you, either. It's also available in plenty of formats - VST, AU, RTAS and AAX to be precise. You can download Transient now from the Audio Assault website.